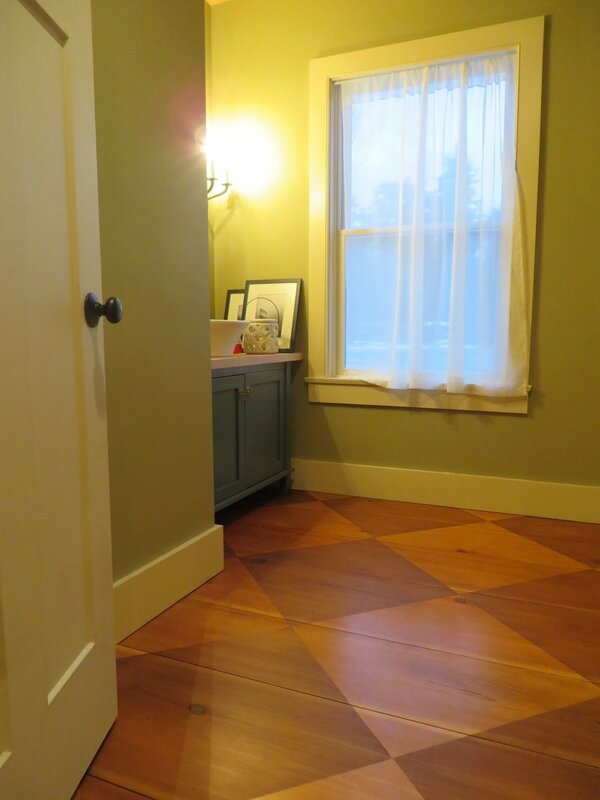 The glazed and painted wooden floor can make the conventional memorable! Whether you have: Reclaimed or new: pine, fir, cherry, or white oak floorboards, a decorative pattern created with a custom mixed glaze and stain will bring your kitchen, bath or stairwell out of the standard domestic level. After the design is completed the floor is sealed, giving years of use and unmatched beauty. The decorative design possibilities are endless; and with the use of hand-cut, custom stencils you can create one of a kind rooms. The images you see are wonderful examples of showing how the beauty of the wood is still apparent despite the glaze painted on. In our next edition, we’ll speak to color in designs and patterns that do not need a great wood base to begin with.